Home owners will help our economy by reducing demand on our existing housing stock (and resulting price increases that few can truly afford). We do not charge for what we do on this website. We are raising community, not money! Not only can home owners help by hosting displaced residents, but more importantly our visiting contractors will far outnumber the people displaced and we need to give them opportunities so they don’t use our precious housing stock needed for long term residents. If you want to know what your local municipality allows, visit here. How our process works is we will suggest a few potential matches and introduce you to them. We also wish to support other organizations seeking properties. Please treat this as a typical landlord-tenant relationship, by doing your own due diligence on the history of your new friend(s)/neighbor to show care and consideration for your kindness. After determining a good match, then we will offer forms for you to formalize your agreement. If you wish to hire someone to do the screening and rental agreements for you, we know a few people who can help. After that we will guide you both with on how to get a temporary dwelling permit, how to establish utilities and deal with flood and tree hazards, be a good RV neighbor, and avoid common expensive RV mistakes. We care very much about setting everyone up for success. 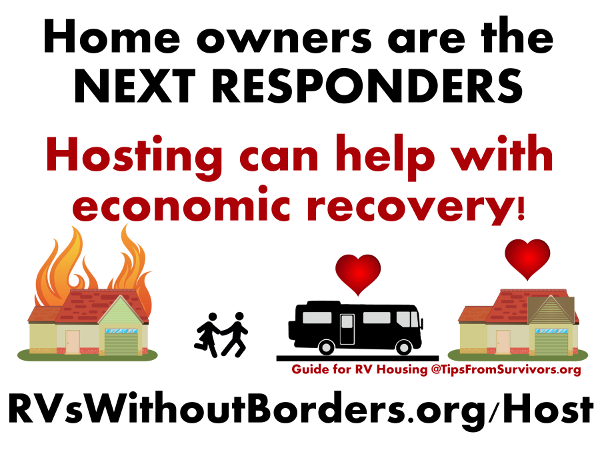 Everyone will benefit from this community resource… the homeowner, the RV user and everyone who needs to find affordable housing post disaster by adding inventory to our housing stock. If you know someone that would like to donate an RV directly to a person in need, we will be happy to provide you a tax-deductible charitable receipt for the private party market value of the RV. 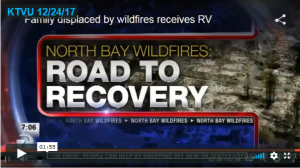 If you have someone identified to receive the RV, we can help too, as long as there is a charitable need. We look forward to welcoming you into our wonderful community of friends of RVsWithoutBorders. The friendships you will make will be treasured and last a lifetime because what you are doing changes lives and builds stronger communities.